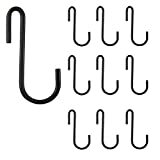 Buyer receives pack of 10 black finish hooks. The hooks can be used for hanging signs, apparel or other miscellaneous items in your store or home. -Material: Rolled Stainless Steel -Color: Black -Height : 3.5″ -Diameter of Arcs : 0.5″ and 1″ 1/4 -S style hooks – made to handle heavier loads.